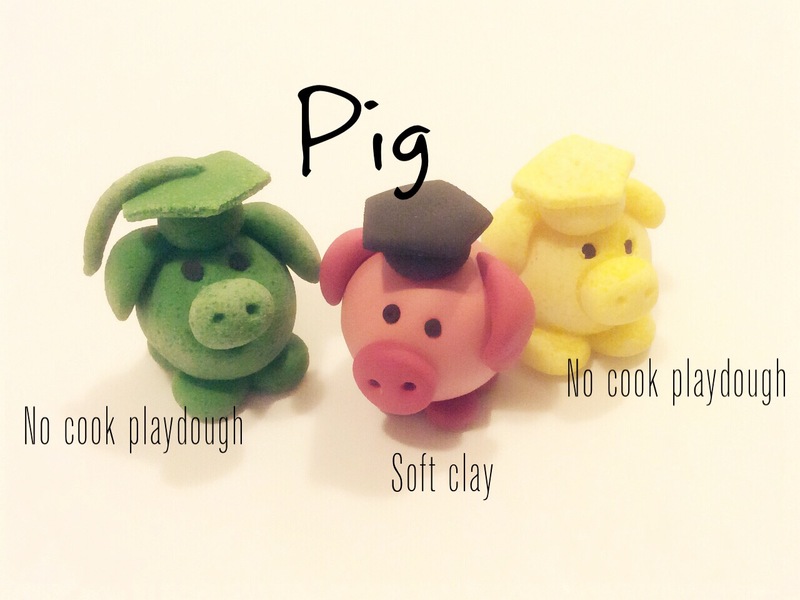 Why pig salt dough craft? Many people don't like salt dough for figurines. They prefer this material for Christmas tree or other decorations where most of the time they just flatten the dough with rolling pin and cut it into certain shapes with cookie cutters. But hey...wait a minute. I've found that you can actually mold this dough to almost anything like what I did recently. I created 12 animals with salt dough. It's easy and fun! I chose this material because I can bake the dough to speed up the drying process and paint the figurine after that. First of all, prepare your salt dough. 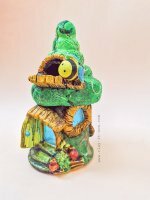 You can find the steps at our modeling clay recipes page. Lay a sheet of wax/ baking paper on your baking tray or on the kitchen table. 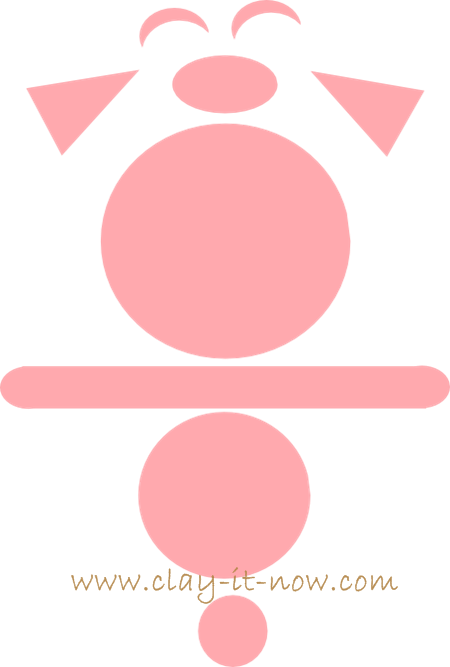 Make some basic shapes following the above diagram. Start with 3 different sizes of ball shape, 1 oval, 1 sausage, 2 small crescents, and 2 triangle shapes. Start attaching all those shape start with the medium size of ball shape. This would be the pig's body. Take the small ball and flatten it with your finger and then place it on top of the medium ball shape. After that, take your sausage dough shape, bend it a little bit and place it on top of the medium ball shape. And then place the big ball shape on top of the sausage. This is your pig's head. Attach the small oval shape on the pig's head. This would be the pig's snout. Use your clay tool or toothpick to make two holes. Shape the pig's mouth and make two holes on top of the snout for the eyes. Place the two small crescent shapes on top of the eyes. And place the pig's ear at the left and right side of the eyes. Lastly, insert the jewelry hook before baking so you can hang it, attach the key ring or rope later on. The figurine is ready for baking now. I would suggest that you bake couple of pig figurines or other animals as shown in my Chinese zodiac page at the same time so you won't waste your electricity. Set your oven at 220 degree Celsius and bake your creations for about 15-25 minutes depend on the quantity you have. Cool down your figurine for few minutes after baking and then scrub the pig with sanding paper for smoother surface. Apply a layer of acrylic undercoat paint. And then apply other color you like. You might want to check my coloring technique page for better idea. Don't forget to apply varnish or clear nail polish to protect the figurine. Here is my pig salt dough craft after sanding and adding the black eye beads. 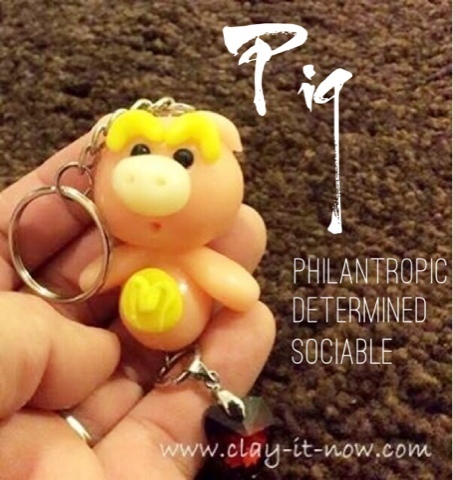 By the way, I also make the same pig style in cold porcelain clay for key chain. 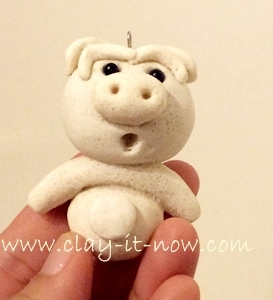 Hope you enjoy our tutorial and please share your figurine if you follow our pig salt dough craft tutorial or if you have done it in different style.